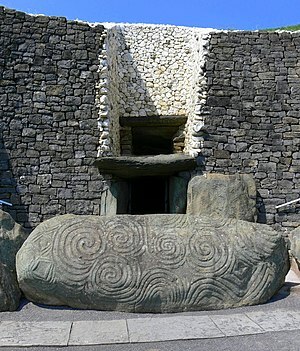 Newgrange, Conor Kelly and The Four Treasures of Eirean. I knew I should know who Michael was, and I racked my brain, but I was distracted by all the commotion of my family visitors. I must have sounded a bit vague. I sat down quickly in the nearest chair. It was my office chair, and unfortunately it had wheels. As a result of my forced landing, it careened wildly off across the wooden floor at speed, which did nothing to help me regain my composure. Three hundred copies! My biggest order to date, and that without even seeing a copy. Problem? How could it be a problem? So began a whole new adventure in my world of self-publishing, one which involved a new revamp of the back cover image, revised blurbage, and the hunt for a new printing company. Michael had no idea what he was putting me through with that first order! But I did it. And as of last Wednesday, Conor Kelly and The Four Treasures of Eirean is now proudly on display in the gift shop at Newgrange Visitor Centre. I am so proud to see my book there. I think about it every day, wondering if it is selling, and when would be too soon to ring or email to enquire. You might be asking why they would be so keen to represent a self-published Indie author no-one’s ever heard of on their premises. Well, part of my story takes place at Newgrange. The story is aimed at Young Adults, an age group which they are trying to engage. In fact, when I delivered my books, a party of teenage school children were perusing the gift shop at the time. Newgrange is a wonderful site, one of my very favourite places ever. You can actually go inside it, touch the ancient stones, and imagine the lives of the distant people who created it six thousand years ago. To date, we are still uncertain how or why they built this place, and many others like it. Over 200,000 visitors come to Newgrange each year to experience its magic for themselves. It is one of Ireland’s top tourist attractions. I once applied for a position there as a tour guide, until I realised I was expecting my son, Malachy, and had to cancel the interview. Now my book is on the shelves in their shop. I certainly never imagined that was possible ten years ago! what I see so now i’m following you. Look forward to looking at your web page repeatedly. Thank you so much, glad you found your way here! Hope you continue to enjoy the content you find here.